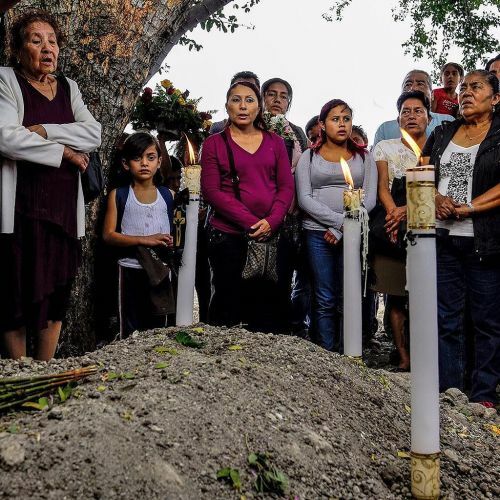 "Juana Ocampo, right, attended a ceremony at her daughter's grave in #Temixco, a city of about 100,000 people in Mexico. Juana's daughter, Gisela Mota, was killed just hours after taking office as the city's first female mayor. After arresting 2 men suspected of killing the 33-year-old politician, police said the murder was part of a regional campaign by a cartel called Los Rojos to control town halls and rob the towns' resources. Meanwhile, in recent months, Los Rojos has threatened 13 more Morelos mayors. The photographer @adrianazehbrauskas took this photo for a story about why cartels are killing Mexico's mayors. Visit the link in our profile to read the full #nytopinion story. #nytweekender" By nytimes on Instagram.